Inscription: Caron L Mosey, She gathered signatures on the quilt as a donation for the Society, raising over $1,200.00 in the process.Other Notes: The center portion of the quilt features buildings and scenes from Flushing’s past, including the old High School (now the Junior High), the old bridge, the Mill, West Side School, First Presbyterian Church (now the community center) and of course, the depot., Caron had an exhibit of her quilts at the Citizens Bank Gallery, Flint, MI; February 16-March 13, 1987. Author of Contemporary Quilts from Traditional Designs, copyright 1987, P.F. Dutton. 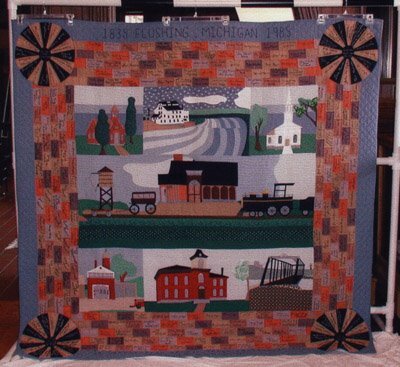 Presented with the Third Orrin Hart Award for Historical Preservation by the Flushing Area Historical Society, December 1984, for The Flushing Sesquicentennial Quilt. Beautiful pieces. Both this one and Jack in the Beanstalk. Such detail. 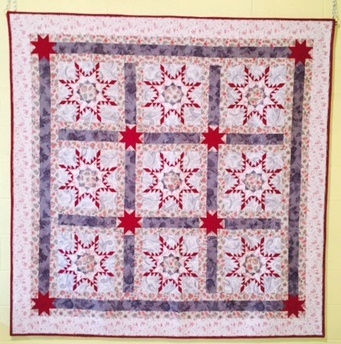 It may be vanity, but One thing that I love about quilts and quilting is the legacy left behind. Kind of Like footprints of a person and their talent….